If you’ve ever wanted to try your hand at shooting with a bow and arrow, a beginner’s course is the best place to start! At RPB we run at least two Beginner’s Courses a year: one indoors during the colder months and one outdoors in late spring. Our course dates can be found on our Club calendar. Our courses cost £68 per applicant, with all the necessary equipment needed to take part in the course supplied. Our coaches with some archery beginners. All our courses are led by our experienced AGB Level 2 Coaches. All our coaches have been DBS checked, and provide lessons suitable for both adults (over 18) and juniors (aged 10-17). Our next beginner’s course will be held at our field in June. Details about this course and the booking form can be found here. 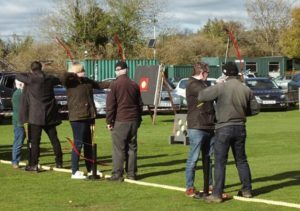 If you have any other questions regarding our courses or would like more information about the club, please email beginners@reigatepriorybowmen.org.uk.